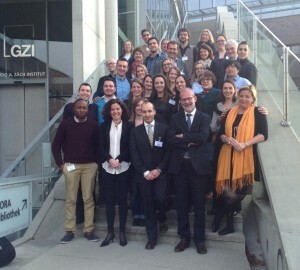 On 19th and 20th March 2015, a MARATONE project meeting took place at the Ludwig Maximilian University of Munich. MARATONE (“Mental Health Training through Research Network in Europe”) is a Marie Curie Skłodowska Initial Training Network that is funded under the 7th Research Framework Programme and of which EBC is an associated partner. At the beginning of the project, the consortium of MARATONE recruited 14 Research Fellows (Early Stage Researchers – ESRs) from 13 countries who are conducting research projects, with completing PhD in mind at a final stage. The ESRs have multi-disciplinary background in areas such as: epidemiology, health economics, law, medicine, mental health systems and policy, psychology, psychiatry, and other health professions, political science, public health, and statistics. On 19th March, ESRs presented their research carried out so far and benefited, on that occasion, from an extensive feedback from the project partners. On the following day, the MARATONE mid-term review meeting took place and, following the key-note speech from Prof. Martin Prince (King’s College London), principle investigators had a chance to provide an update on individual projects as well as discuss all pending issues. The EBC is providing the ESRs with an opportunity to get insights on how science is translated and communicated in the policy-making setting. In the coming time, EBC will consider organizing secondments in its Brussels headquarters for interested ESRs.